Sometimes the best thing that you can do is to begin at the beginning. One of the most commonly asked questions about sea-run Cutthroat trout fishing is: "What tide should I fish?" Of course the answer is complicated, because it will depend mostly on where you want to go fishing. Some places will fish better on an incoming tide, or some part of the flood will be better than another part of the flood. And it is a kind of dogma in beach fishing that the best time will be the two hours before high tide, and the first few hours of the ebb. 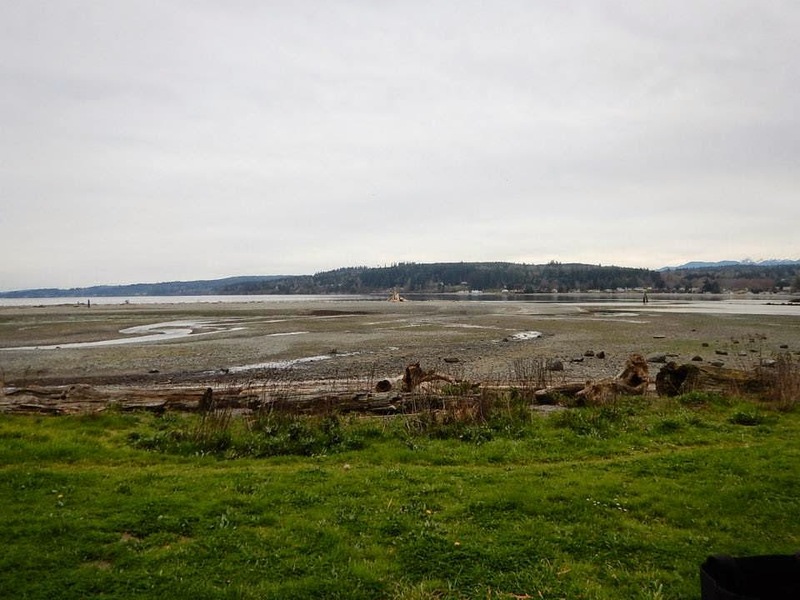 Still other locations may fish best in the last part of the outgoing tides. And as if that was not confusing enough for you, in some locations we have caught a lot of fish at low slack. On dry flies!!! Sea run Cutthroat are one of the more adventurous trout, and they move along the beaches frequently, they don't "live there", they just feed there. So you have to be willing to go hunting for them too. What a difference six to eight hours can make. If you are going to be fishing some place new to you, try getting there at the bottom of the tide, at low slack or just before that. If you have the time to do that, you will learn a lot. 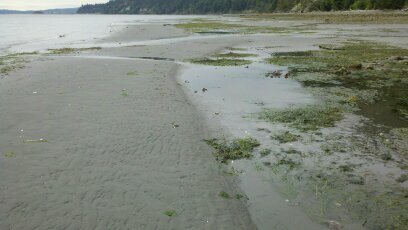 One of the first things you will see is the bottom structure, and how water moves across that area on the outgoing tides. You will find holes and cuts, rocky areas, soft sand and mud areas, and places where the tidal currents have scoured the bottom clean of all but the cobble and stone rocky areas, that look so much like a river bottom. That usually indicates strong current at some point in the tides. And you may begin to get a sense of where the bait might be at the bottom of the tides there. Look for eel grass beds, drop of ledges, channel edges, kelp etc. from a good current atlas like this one. 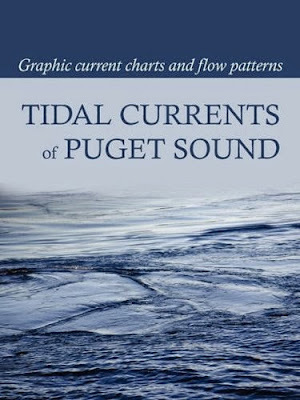 By fishing an entire incoming tide, and paying as much attention to how the water flows, and how it moves into an area along the shores, how water fills the low places and runs over the bars etc, you can begin to get a sense of how the bait might move on that tide too. 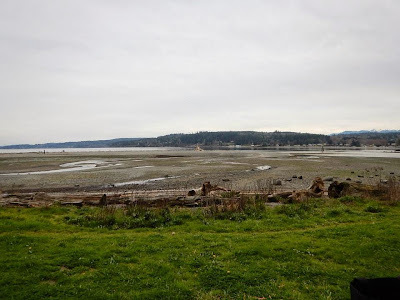 How they might get pushed by the stronger flows, into small back eddy areas, shallow lagoons and tide pools, where they might hide in an eel grass bed along the shore etc. This is something that the trout already understand. They depend upon these situations to sustain them. But if you want to catch those trout, you will need to become a student of their habitats and forage species too. It's all about the movement of the tides. The more time that you spend on the beaches, the more that you study a situation and location, from every tidal circumstance, the more you will see and learn. Cutthroat trout love to move in on flats like this as they flood with the incoming tide. Fishing an entire incoming tide can be exciting, as you watch things come alive around you. Why wait to fish only the last hour or two of that? That's my basic approach to learning a new location to fish. But I won't wait for low tide, or for high tide, if I don't have the time. If there is one moment in saltwater fly fishing in this region that I will be attuned to it is any change in tidal flow, and current, direction or speed etc. Fishing at the edges of one tide moving into another can be propitious. Don't get stuck in the high tide mentality. And just because there is a full or new moon, with way more water moving on the tides during those days, does not mean that your fishing will always be better in every location. Sometimes those stronger flows, of greater velocity and duration, will simply flush all of the bait away from your favorite spot, carrying it miles away, perhaps for days. A softer tidal exchange, with less altitude, and weaker velocity of current, might keep the game in front of you all day. And of course, it all depends upon where you are fishing. There is more to this, much more. But you need to get out there on the water and put in your time to learn it.